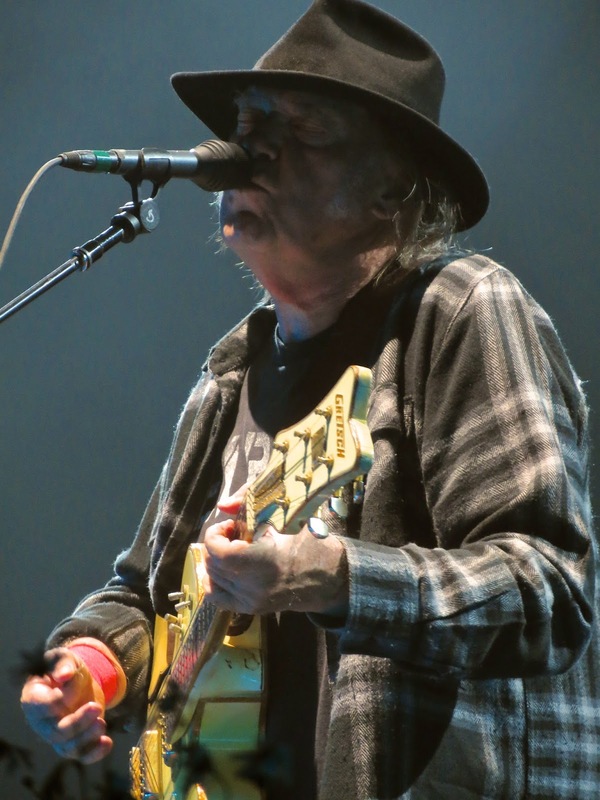 The most recent concert of Neil Young + Promise of the Real in Amsterdam on July 9, 2016 , seems to be a high water mark of not only the tour thus far, but possibly of Neil's entire 42 year career. It was without doubt an epic night in Amsterdam by all accounts. 26 songs. 15 different albums represented. 3.5 hours. 2 song encore. and so on. 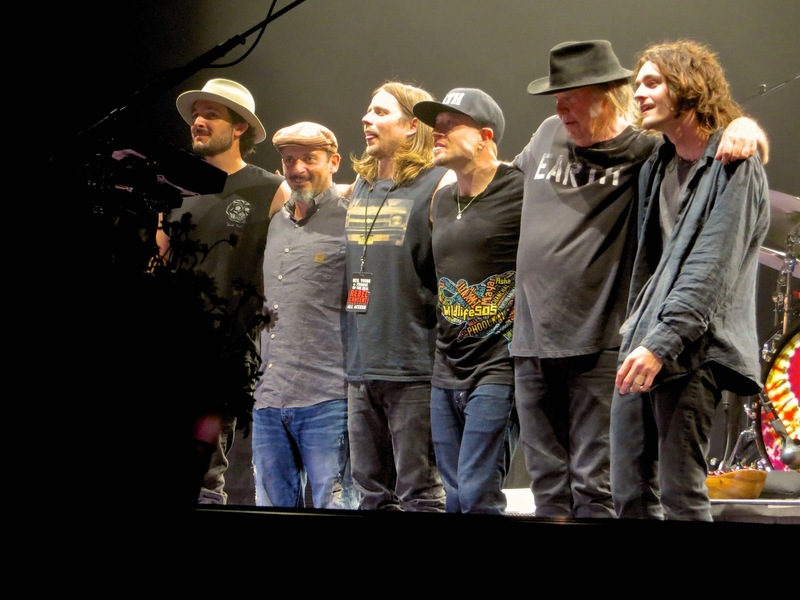 This was the longest concert of the current Rebel Content tour and apparently the longest Neil Young concert in his career. "Don't Be Denied" and "Change Your Mind" were played for the first time on the European Tour. The total number of different songs of the Tour now up to 57 per Sugar Mountain's Chronological Grid. Also, two song encore: "Like An Inca" & "Here We Are In The Years". That’s how it felt to be at the Amsterdam show of Neil Young and POTR. It was a phenomenal performance, with many surprises, a tremendous atmosphere, fabulous bandwork, and an amazing setlist. Three and a half hours of craftmanship, powerhouse rock and marvelous ventures into the deep catalogue left the audience in awe, exhausted, and immensely thankful. The venue, Amsterdam’s Ziggo Dome, was about sold-out; there was a brisk trade in left-over tickets on the internet. The pitch was full, and almost all seats in the theatre were filled. The crowd was a fairly mixed lot – I’ve seen tweets mentioning a deluge of 60-olds, but the people in my range of observation were mostly mid or late 40-ish, not just wheelchair hippies or the curious youngsters coming to have a dinosaur experience, but knowledgeable fans. The dress code was as you would expect: extremely unfashionable. Few lumberjack shirt though. The sound in the venue was amazingly good, very clear and warm. After the silly farce of the sowing girls, Neil started with his standard set of acoustic biggies. The first notes of After the Gold Rush were electric. It surprised me how much feeling NY still can put into these songs, which he has played hundreds of times. I never understood NY’s urge to repeat these worn-out songs. But they were not stale: they rang soulful and true. Proof of the vibe NY succeeds in putting into his old songs. Even Heart of Gold, never a favourite, sounded great. The first surprise came early: #4 in his setlist was Razor Love, a vulnerable song of great beauty (only played once before in the Netherlands). Compared to some other tours in the past, NY kept his solo acoustic set short. A pity, maybe, but it shows how eager he is to bring out his band, to show its versatility, and delve into the extensive song catalogue. Indeed, Promise of the Real can almost do anything; they’re like wax in the master’s hands. He trained them, trimmed them, and let them shine. The country-rock songs of the second part of the set fit POTR as a glove. A great surprise was Hold Back the Tears, which I never heard before live, and indeed has been seldom played. It’s pure country music, and the Promise did it well (but oh, how much Ben Keith’s pedal steel is missed here; Lukas Nelson’s attempt to imitate its sound was extremely well done, but remained an imitation). Following that were some of the standards of this tour, Human Highway, Someday (! ), a memorable Words, and great renderings of Winterlong and Alabama. POTR is giving those songs a bit of a jumpy bite. By the way, it seems to me that Micah Nelson is closest to this kind of repertoire. I had the feeling – for what it’s worth – that the other members were looking forward to get to rockier shores. Love to Burn opened the Old Black set and was one of the highlights of the evening. I was never extremely fond of the song, like many songs of Ragged Glory that tend to sluggishness, but this version came with a vengeance. POTR gave it much more swing. Lukas Nelson’s part was remarkable: with his quasi-soloing, partly in Q&A with NY, he gave the song a funky syncopation that turned this guitar sludge into a dance party. Unfortunately this did not happen with other Ragged Glory classics – Mansion on the Hill and Love and Only Love, which sounded slightly uninspired and may better be left to Crazy Horse. POTR demonstrated that they can do straight stadium rock too, with great versions of the Crazy Horse evergreens Rockin’ in the Free World and Powderfinger. Fascinating were rarities from Sleeps with Angels: Change your Mind and a beautiful Western Hero. Out of darker days came Don’t be Denied and Revolution Blues. What to say. It was a privilege to hear them both in this concert. Don’t be Denied was soaring, as it should. Revolution Blues was an absolute pinnacle. What a prodigious interpretation of one of NY’s greatest songs. The encores were not entirely successful to my taste, perhaps because of their adventurousness (what a silly criticism, but maybe you get the meaning). Like an Inca was another great find from the deep catalogue but had too little variation and pungency as a closer, and NY tried to sound angry, but his voice was strained and shrill. Here We Are in the Years came as an immense surprise, and it is courageous to have it at the end of the show, but its subtlety makes the song fit better in the early part of the show. Let’s not nitpick. This was a great great concert, adventurous, masterly and rewarding. 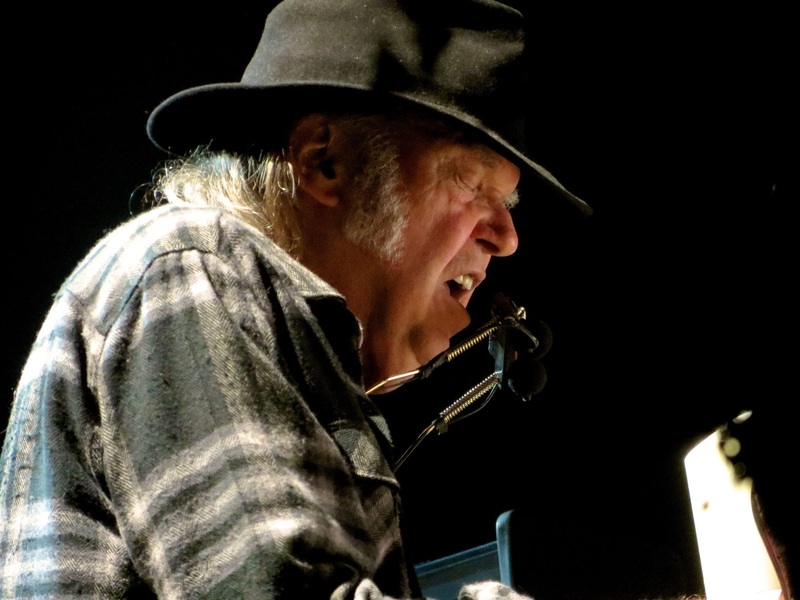 As has been remarked before: Neil Young’s voice shows only little wear from age. His many mistakes are forgiven; they are part of his attitude. He is not a crowd pleaser. He does not reach out to you but draws you into his amazing musical world. 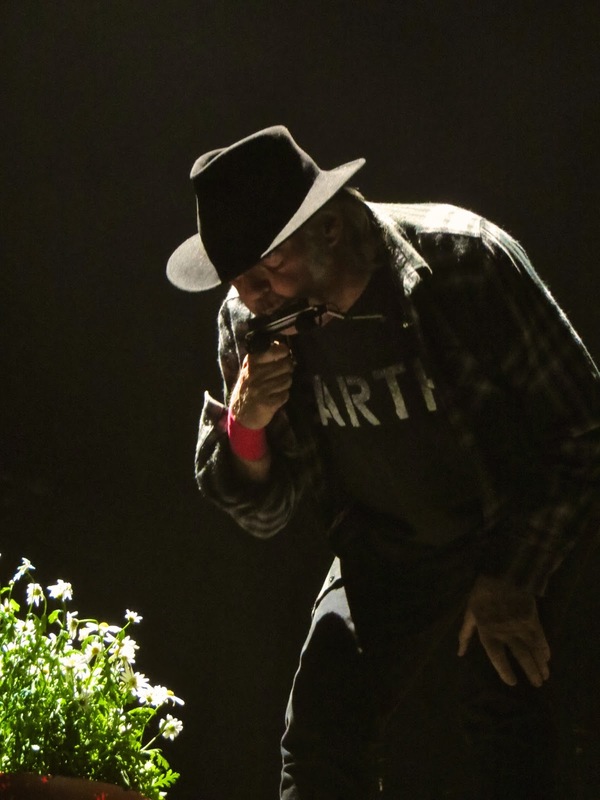 Neil Young in 2016 is about Promise of the Real: they are his backbone, his two feet, his home, as much as Crazy Horse was, but differently: while Crazy Horse offered a basis of concrete, hard-boiled rock, the Promise is a rubber base, moveable and spongy but offering better stability during earthquakes. 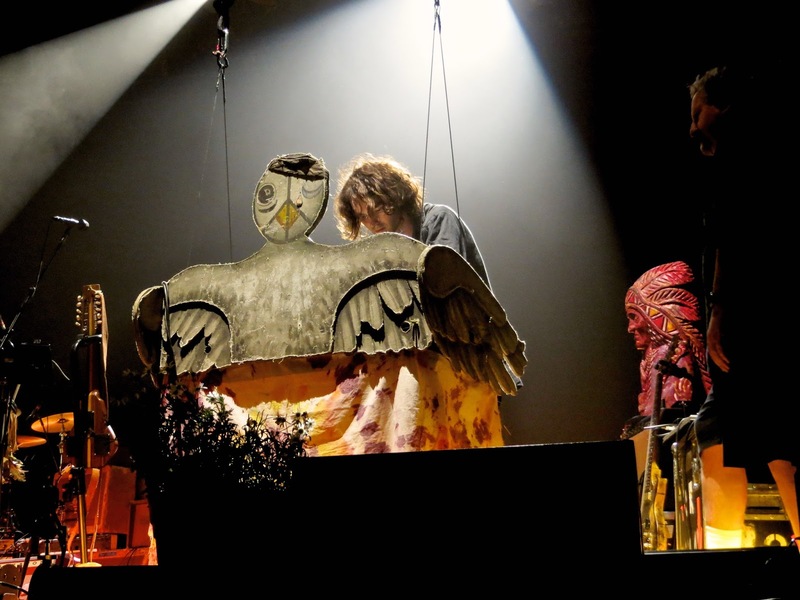 POTR are a supple team that is able to follow most of NY’s many stylistic turns in his oeuvre. Hagiographic or star-centred rock journalism always suggests that Neil Young makes his bands, that he is the domineering figure. That is only partly true: he is heavily influenced by his musicians, and listens carefully to them. 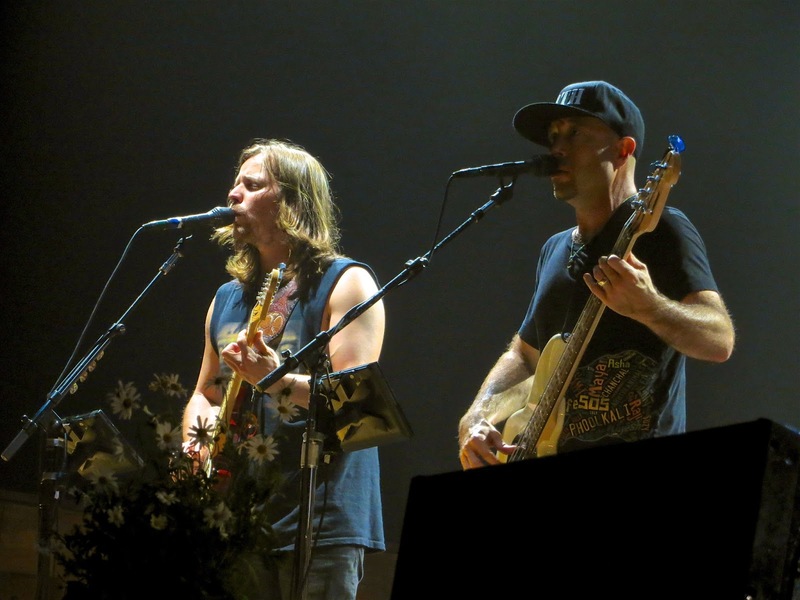 Although the Nelson brothers are in the limelight of press attention, the band actually centres around the rhythm section, Anthony LoGerfo on drums and Corey McCormick on bass. Together they can produce a steamroller cadence, a bouncy-ball pulse that gives NY’s music a new twist, very masculine too but funky and agile. This was in evidence in great renderings of Alabama, Seed Justice, Love to Burn and Revolution Blues, and many others. LoGerfo has a nice roll that brings swing to NY’s sound, much more than the chopping style of Ralph Molina. Corey McCormick remains for me the pumping heart of this band (no wonder NY keeps him close during the concert; they seem to have the most rapport), and the essential figure that brings the necessary funkiness to NY’s rock, which over the last 25 years tended to bog down a bit. Add to this the conga’s of Tato Melgar: they bring some smoothness and support the bounciness of the LoGerfo and McCormick. The evolution of Lukas Nelson over the last year has been the most remarkable. A great artist in his own right, his role is the most difficult: his talent, and his ambition, who knows, had to be domesticated. As others have remarked here: the less notes he plays, the better he fits the music. Sometimes he did not play at all, at times he just added some sparse notes. Interestingly NY gave him much room, and did not indulge in endless soloing of his own. I must confess that at times I missed Frank Sampedro’s guitar groundwork. Besides, I do not like Lukas Nelson’s guitar sound, and his blues style does not fit all songs, to my taste. Micah Nelson brings a bit of irony and madness, which always has been part of NY, but was a bit neglected or heavy-set in the CH ambiance. It crucially adds a new dimension. 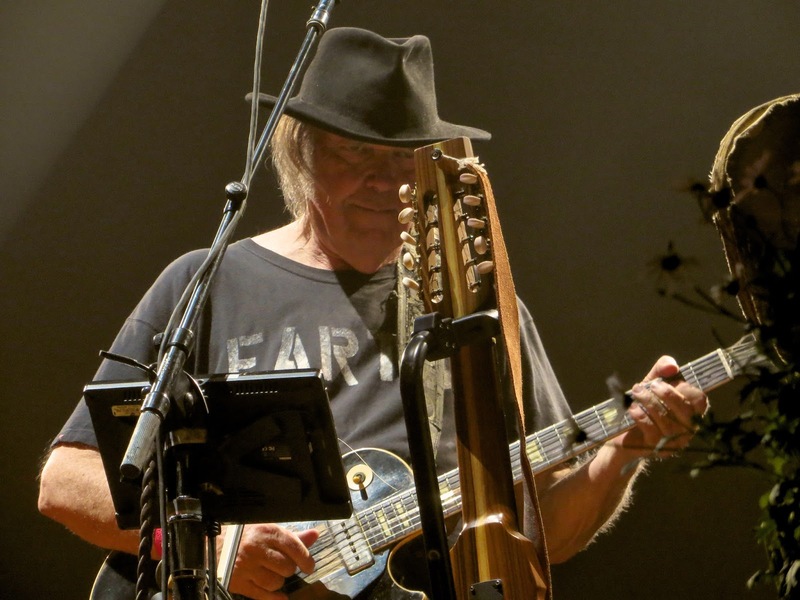 It is easy to understand Neil Young’s love for this band. They rejuvenate him and urge him to revisit and explore the wide expansion of his own music. A courageous thing to do at 70. This demonstration of musical mastery left the audience completely knocked out. What a great performance, one of the best I’ve heard and witnessed. Change Your Mind played again last night in Montreux, with a Cortez/Cinnamon Girl encore- we'll see what happens tonight in Italy. Looks like we missed posting up Montreux Jazz Festival. It was added after tour dates announced, as we recall. Updated post up now.